February 13th, 2014 – As one of the first trendy budget hotels near to Makassar's Losari Beach, Archipelago International's favehotel Daeng Tompo introduce a new standard of accommodation to the area when finally opens its doors for a soft opening. favehotel Daeng Tompo is ideally located just 5 minutes from Makassar's famous Losari Beach which lies in the southern part of Makassar, South Sulawesi. The beach was once dubbed as the world's longest dining table because of the seemingly never-ending tent stalls that sell fresh seafood, peanuts, bananas and other local snacks along the shore. In fact, in the early days, Makassar residents called Losari Beach the Fish Market and to this day visitors can still encounter many indigenous merchants who sell their ocean goods upon the sands. Makassar is the provincial capital of the South Sulawesi region which offers a number of diverse tourist attractions. Guests will certainly want to visit the natural, elongated and mountainous beaches, as well as discovering the region's marine tourism, agro-tourism, cultural tourism and the many historical landmarks of the county. favehotel Daeng Tompo is also just a fifteen minute drive from the Fort Rotterdam museum, the central post office, money changer, souvenir shops and banks, as well as the convenience of downtown Makassar right at the hotel's doorstep. Guests can also enjoy easy access to the Trans Studio Makassar and GTC Mall, as well as the Sumba Opu souvenir shopping centre nearby. 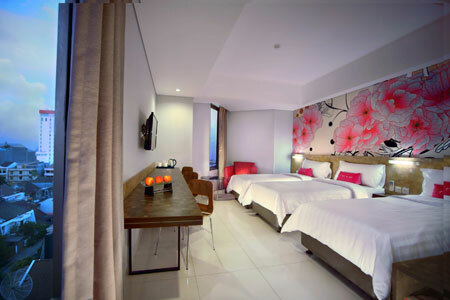 The hotel is just 45 minutes from Sultan Hasanuddin International Airport. favehotel Daeng Tompo is the first of its kind on the island offering a perfect blend of style, functionality and value. Leisure and business travelers not only have the beautiful Losari Beach at their fingertips but also a selection of onsite facilities to accommodate them during their stay. The hotel's 141 modern, functional and stylish guestrooms are complemented by free high speed WiFi that extends throughout the entire hotel, whilst outside of the fun and fresh rooms, guests can savor international and local cuisine at the all day funky café-shop before dipping into the hotel's swimming pool. Business travelers can make use of the three modern and intimate meeting rooms, as well as the hotel's ample parking space. The favehotel experience is topped off by the passionate and proficient staffs on hand to make favehotel guests’ stay convenient and thoroughly enjoyable. 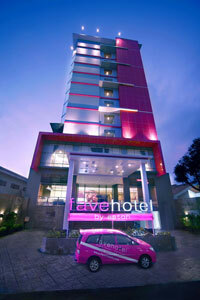 favehotels currently operate 8 hotels in Jakarta, 5 in Bali, 2 in Bandung and Solo and 1 each in Balikpapan, Langkawi, Surabaya and Yogyakarta and has a large development pipeline in Indonesia, Malaysia and the Philippines.